Over at the Byrdie HQ, we take trips to the nail salon very seriously. It's such a special time to relax and tend to yourself. We also know that it is not an easy feat finding amazing nail salons. In a big city like New York, which houses too many nail salons to count, discovering the really good ones takes a lot of crowdsourcing, Yelp scrolling, and certainly some experimentation. Walking out of the salon and thinking about all of the ways your manicurist could have cut your cuticles better or done your design differently is a feeling we'd rather avoid. So we've got you covered with the best NYC nail salons that will not disappoint. Trust, the service of the staff, vibe of the salons, and designs they offer are top notch. That said, these places book up fast. If today's your day to treat yourself, we suggest you give one of the below a call ASAP. And now for some of their most Insta-worthy salons the city has to offer. Fact: Ask a group of It girls what their favorite salon is, and I guarantee one of them will say Paintbox. The salon has an entire book full of one-of-a-kind designs that are so memorable I can spot a Paintbox mani the second I see one. Even better? You're never without a glass of champagne while enjoying your mani. Want nail art that'll automatically earn you compliments? Vanity Projects is the spot. Its bold and original designs are not for the faint of heart—you'll seriously stand out with these innovative paint jobs done by some of the most sought-after nail artists. If you want to have more fun with your nails, this place is for you. Another salon known for its insanely good nail art, Valley is everyone's favorite. Real talk: The salon features an array of designs that'll speak to whichever mood you're in. Think chill vibes for the ultimate cool girl. Enjoy the low-key comfort of Chillhouse by indulging in one of the brand's signature manicures (it recently welcomed 10 new designs) over a delicious matcha or wine. It's essentially a woo-sah haven, decked out with a café, nail salon, and massage rooms. Loved by celebs like Sarah Jessica Parker, this upscale nail salon created by the one and only Jin Soon Choi herself, is incredible. Its fresh and airy space will immediately relax you. Not to mention you'll only find quality polishes that'll ensure a banging paint job. Yes, the salon's service is impeccable, but I can't get over the genius concept of Sundays Nail Studio. It doubles as a wellness center, offering space to hold events and focus groups. Plus, the décor is unmatched—you'll feel like you escaped into a land of zen. You just have to see it for yourself. Akiko Nails doesn't feature just any nail art, it specializes in Japanese design techniques. The artists are trained to make your wildest dreams come true when it comes to your nails. I've been dying to go here for the longest—it must be the neon pink sign that just screams cool. We'll admit it: Décor matters when it comes to good nail salons. If the place doesn't look chic, we don't trust it with our nails. Bisou is the cream of the crop when it comes to its interior, and its nail designs do not disappoint. What's even cooler about this space is it's so intimate—it only has four stations. So you'll pretty much feel like VIP. Ask a group of editors what their favorite nail salon is and I guarantee you'll hear Tenoverten. Free of traditional toxins most nail polishes have, you won't have to worry about unsafe ingredients. With several locations around the city, you can always rely on an A1 manicure here. So many nail polishes are made with harsh chemicals that are dangerous to wear and horrendous for the environment. Hortūs nail shop prioritizes conscious products that are all certified organic. The relaxing vibes of this Lower East Side treasure will win you over. 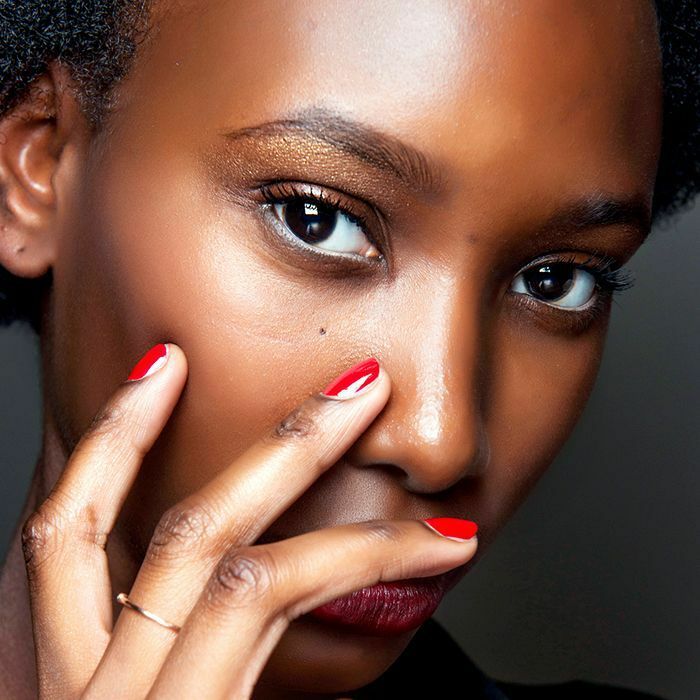 Want to keep your nails long, strong, and healthy so your mani can look even better? Read up on the best vitamins for nails podiatrists recommend.